It is very simple to start writing text in a Google Doc. The clear interface is reminiscent of early day word processors, from which Microsoft Word departed long ago. Formatting options in Google Docs can quickly be found in the main toolbar and it is especially efficient to format a Google Doc using text styles (Title, Heading 1, Heading 2, etc.). In terms of presentation, Google offers a restricted number of default fonts. In a few steps, I will show you how to quickly add fonts to Google Docs. Click on the font drop-down menu. Add a checkmark in front of the fonts you would like to add. Display: these decorative fonts are adequate for posters and banners. Handwriting: fonts made to look like an actual person’s calligraphy. Monospace: each character in the font is the same width as the other characters. Once you add fonts to a Google Doc, these typefaces will also be available in Google Presentation. 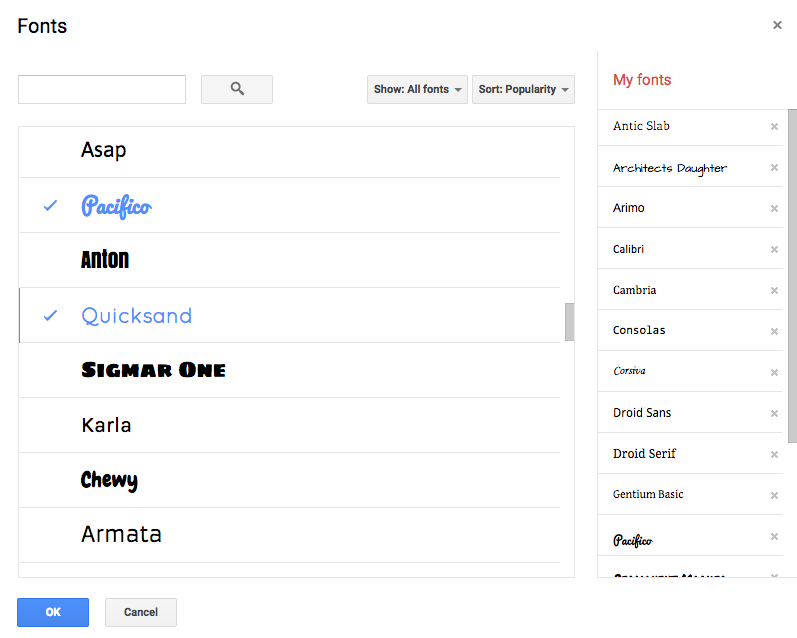 If you dig a little on the Google Fonts website, you can also download the fonts and add them directly to your system. Share with me your favorite font in the comments below!